A lot has been written with regards to what features we might possibly see make their debut in the upcoming Apple iPhone 5. There have been numerous guesses – some stemming from reports coming from alleged “inside sources,” while others - from the blogosphere's observations of how the manufacturer has been upgrading each subsequent iteration of the product. The sad truth, however, is that currently no one, except for select Apple employees, has a real idea of what the iPhone 5 will be like. That's why we arrived at the conclusion that it'd be best to offer you a balanced mix of stuff, which is highly-probable to make rounds with the iPhone 5, while at the same time briefly venture out of that safe zone to offer you a taste of our own, personal wishes. Of course, there's no guarantee that any of these will happen, but... well, October 4 is right around the corner, so everything will be clear very soon either way. Well, it's not a secret that this is probably the number 1 most desired feature right now. Apple's App Store features some truly amazing content - from really robust and feature-packed productivity apps, to graphically-intensive 3D games, which, many would argue, that just cry to be viewed on a bigger screen. We agree. When the very first iPhone was launched, there were no such games, and no such capable apps. Its 3.5” screen was among the biggest out there, and was perfectly fine. Nowadays, things stand a bit differently. We have all this amazing content, which could be better enjoyed on a screen that is somewhat larger than 3.5 inches. Android manufacturers have already found that out, and it seems most of their customers don't object having 4+” handsets. Now, knowing Apple, it will hardly opt to deliver such a great screen size difference, especially when this is still tightly related to overall device size. But, we wouldn't be surprised at all if Cupertino finally makes the jump to a 3.7” or... wait for it... 4.0” screen size! Of course, should they undertake this, we hope the iPhone's dimensions will not grow by much. How about getting rid of that bezel around the sides of the display? Thinking about it, with the iPhone 4's Retina Display, Apple set itself in a convenient position, which allows it to employ a bigger screen, without sacrificing too much image clarity. Okay, the iPhone 4 does look stunning with its clean front and back sides, made entirely from glass. But it's not a secret that previous iPhones have been more comfortable to hold, due to their rounder backs, which carefully follow the shape of your palm. Many, us included, believe that with the iPhone 5, Apple is going to return to its original concept of a rounded back side, and possibly even switch back to using aluminum, similarly to its approach with the iPad and iPod touch. And why not? Firstly, this will add a nice dose of unification throughout its entire mobile product line-up, and secondly, it will certainly make the latest iPhone more comfortable to hold and operate. Plus, having a fingerprint mess on the front is bad enough for us, so why have this on the back as well? This one's a no-brainer. While some might say that the iPhone 4 already runs as smooth as butter, and there isn't a visible need for a considerable speed boost, let's think about the possibilities a faster, dual-core processor will bring to the table for iOS developers. Obviously, this will let devs design even more capable and useful applications for all of us to enjoy. Additionally, this will grant the iPhone with enough processing power, so that Apple might decide at some point to make the iOS experience somewhat more dynamic, with more animations, livelier homescreen icons and so on. Plus, we already know that Flash Player works great on dual-core Android phones! But, while we know you'd love to witness such a turn of events, we, personally, wouldn't set our hopes too high. 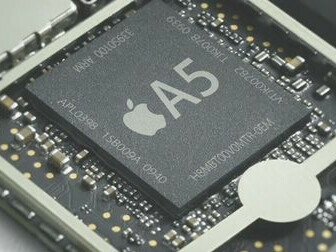 Now, whether or not the said dual-core chip will be the A5 (present in the iPad 2) or not, is still a mystery for us. On one hand, it looks like this is to be expected, seeing how the A4 first debuted in the iPad, and then it was employed on the iPhone 4. However, this time, the time gap between the launch of the iPad 2 and the upcoming release of the iPhone 5 is much wider, so here's for hoping that Apple has also managed to upgrade its custom silicon. An 8MP camera is a very probable asset for the iPhone 5. However, what we would like to see is Apple to utilize a bigger camera sensor, which will actually make the images you capture better, not just throw in more megapixels. The bigger sensor will be capable of capturing more light, thus making for a higher-quality and noise-freer image. Still, the bigger sensor won't get rid of the noise completely, if we're to take pictures inside, in less-lit environments, so we'll need a flash. Yes, the iPhone 4 already has an LED, but its performance is inadequate to say the least. So that's another element which we'd like Apple to improve – a better LED flash. On another note, we expect Apple to enable 1080p video recording with the iPhone 5. This is to be expected, seeing that the iPhone 4 features 720p video capture, and a lot of Android phones already rock 1080p. We find it hard to believe that Cupertino will stay behind with this new product, which will very likely be its top-shelf offering for the year ahead. Again, pushed by its competitors, Apple will find itself in a serious disadvantage, if it doesn't cross the line and step into the world of 4G networking. Currently available on AT&T and Verizon, this means that Apple will have to produce both an HSPA+ and an LTE version of the same handset (could this be the main cause for the delay of this year's iPhone?). But imagine if it's building something bigger. 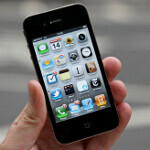 What if Tim Cook and company want to deliver the iPhone 5 to the customers of all four major U.S. carriers? Since we doubt that they will be fine with launching a 4G iPhone on Verizon, and a 3G iPhone on Sprint, for example, we're more willing to think that all iPhone versions launched this year will be 4G-equipped. Well, what can we say – we simply wanted to have some fun at the end of this article! Unless you've been living under a rock (or simply haven't been following Apple), you will know how Apple likes to design an accessory or two for its newest products, just to show how it's done (iPhone 4 bumpers and iPad 2 Smart Covers come to mind). 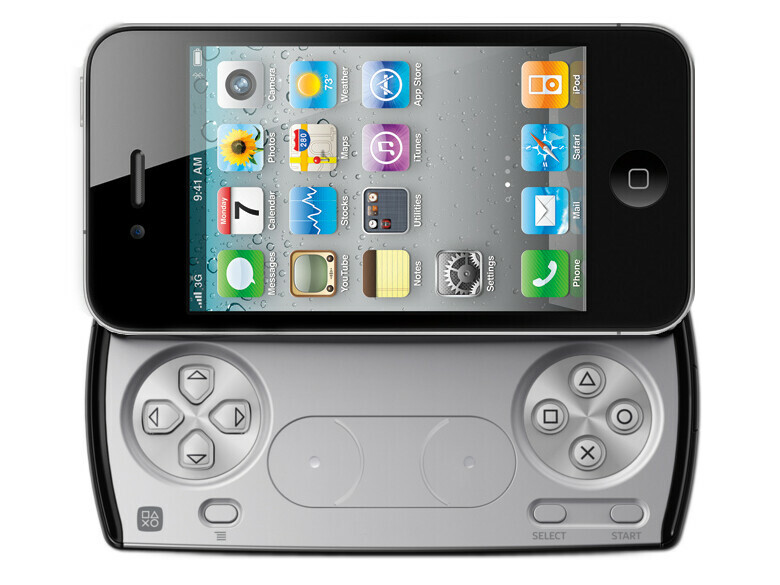 So, how about seeing a gamepad made by Apple? There are lots of good-looking, and time-worthy games on the App Store, and the only real problem with some of them is that they are uncomfortable to play using a touchscreen (think about all those games using a virtual joystick as the primary way to control the player). A well-made and fully-compatible portable game pad will surely fix that, and will likely turn the iPhone into an even better portable gaming device. Once again, while all of the features that we mentioned will surely be warmly-welcomed by users, and are more or less possible, we wouldn't go as far as to say that all of them will happen (though we hope so). But fear not, we'll know what the entire iPhone 5 specs sheet will feature in just a day, and then... well, then we guess speculations about the iPhone 6 will start to make the headlines. That gamepad belongs to sony. well yea, its just a quick mock up, not an actual device.. lol. Tell that to Apple lawyers! Stuff I wanna see in the iPhone 5 - calling functionality. its a f**king accessory. its completely optional. and its completely hypothetical and most likely wont happen. I would never purchase an iphone...!!!!! Cool. Me neither. And after that ? For the phone...bigger sensor would be cool, but bigger sensor with extra-thin design...difficult, no ? so right! everything on the iphone and the IOS is so archaic. The other phones, namely androids are all like "been there done that, moving on." IPhone is so out of date...1080p video, everyone has that now...8MP camera? isnt there phones with like 12.1MP(Nokia N8)and the screen size??? 4" is nothing special...dual core processor, most phones are so. LAME...oh, and the accesories is just another excuse for makeing money off of the consumers! Can you say why ? PS : well, Nokia WP7 will probably be great phones...wait&see. There is not enough room here to explain all the reasons why I would not buy Android again. About 50 of them, actually. My top 5 are: 1. "Forse close" every 2 hours. 2. Turns off(!?!) by itself and only battery removal saves the day(and my job). 3. Does not have a third of the online support that Windows of iOS have. 4. Does not have REAL Office(Word, Excel) and probably will never have. 5. 90% of the apps for Android store are useless or do not work properly. 6(bonus) Has biggest battery consumption compared to iOS, WP or even Symbian. Let me guess, you're one of those that buy 2008 phones in 2010 because they're free? You buy top of the line when it comes to technology, if you don't you're not even allowed to complain. Not fair. I think it's the opposite, early adopters are not allowed to complain. They know what they're getting into when purchasing a brand new device. There's bound to be issues when getting something hot of the design floor. However, when the tech is "mature," I would expect the kinks to be worked out, and for the tech to work without too much issue. With technology as advanced as it is right now, which unfortunately is still in its infant stage, people should know what they're getting into. He bought the 3GS, which was likely paid in premium price. Given his 8 months, he purchased an android phone around December/January. What android phone do you know that was released in late 2010/early 2011 that wasn't 2.2+? Doesn't have "real" office? 90% of apps useless/don't work? Who is he kidding? The same office apps found in iOS are found in Android. The apps on iOS that people label "useful" are all games. Force closing every 2 hours? Force closing barely happens after 2.2+. The guy obviously purchased a low end android phone after the 3GS. Nothing on the software (iOS) side? Without the O/S, you basically have a paperweight. The hype train is strong. Tomorrows is a fandroids worst nightmare. A new iPhone release.